Florida-based Greyhaze Records will bring one of the rarest albums within the legacy of infamous Brazilian black/thrash overlords SARCOFAGO to North American shores for the first time this Spring through the recent partnership between Greyhaze and Brazilian label Cogumelo Records. 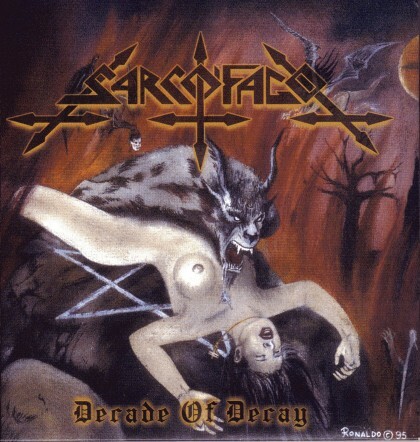 SARCOFAGO’S Decade Of Decay was initially released in 1995, and official copies of it are virtually impossible to find anywhere… until now. Bearing a total of 20 tracks spawned over the band’s career, this reissue of the compilation album weighs in with over an hour and twelve minutes of blasting SARCOFAGO mayhem and debauchery, and even includes three songs from the Satanic Lust demo, two songs from The Black Vomit demo and two songs from the Christ’s Death demo. This represents the first time that SARCOFAGO demo material is available officially. The entire reissue process for this compilation album has been overseen by SARCOFAGO‘s Wagner “Antichrist” Lamounier himself! The first release in a series of SARCOFAGO albums set for official reissue through 2012 and beyond, the first stateside release of Decade Of Decay will take place in North America on June 5th as a 6-panel/full color digipak CD imported directly from Brazil, featuring a full-color fold-out poster with information on all of the songs included. The packaging features never-before-seen photos from SARCOFAGO throughout their various stages, going from INRI all the way to the Hate album. An ultra-limited deluxe 2xLP edition is to be released later in the Summer with details to be confirmed shortly. Florida-based Greyhaze Records is now the official North American distributor for Brazilian label Cogumelo Records. Cogumelo is well-respected throughout the extreme metal world, having been founded over thirty years ago, and having released a steady arsenal of quality death, thrash and grind from acts including Sarcófago, Mutilator, Holocausto, Sextrash, Impurity, Chakal, Psychic Possessor, Ratos de Porão, Vulcano, Headhunter DC, Drowned, Defacer, Calvary Death and more. Cogumelo was responsible for the initial release of the Sepultura’s seminal first three albums — Bestial Devastation, Morbid Visions and Schizophrenia — now exclusively under license to Roadrunner Records. ← Previous Previous post: METAL UP YOUR VCR! – A VHS Tribute To Heavy Metal At Nitehawk In Brooklyn THIS THURSDAY!